Anyone that knows my boys will no that egg dye,Parker and Cole just don't fit happily in any sentence, ever. Well Grandpa thought that it would be fun to dye Easter eggs with the boys this year. So we let him, he lead the whole show and thankfully we undressed the boys before they started. 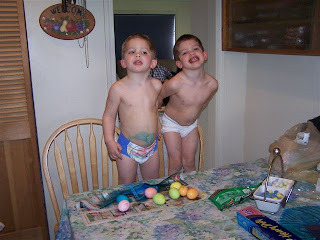 It wasn't more then a few minutes of egg dyeing before blue dye had been spilled and Cole had a blue belly. That blue belly lasted at least two weeks!